Playing on a beautiful day. Devon, Simon, and Langen; Vintage Vinyl in-store. The Defeated County is a St. Louis, MO based indie-rock band, with a reputation for making creepy, catchy indie rock featuring both folk and pop roots. 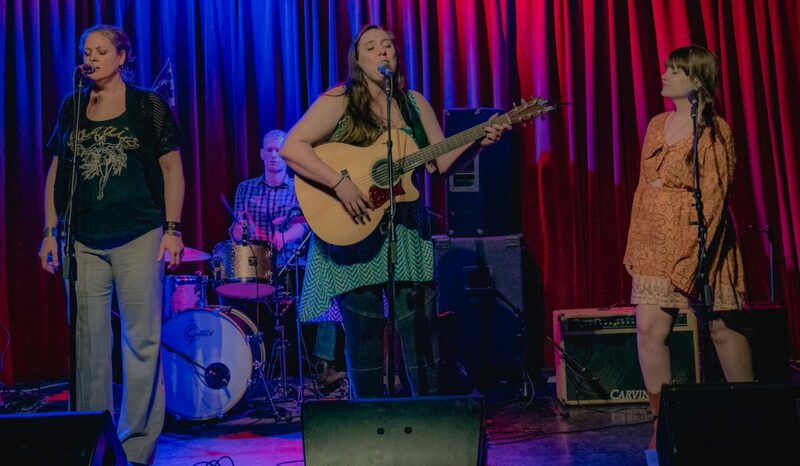 They have been nominated for several St. Louis awards, including best songwriting, best Americana band, and best vocals, by the Riverfront Times and Eleven Magazine. In 2016, Nashville based music blog Ear to the Ground named The Defeated County one of the best new bands to hit college radio. Centered around eerie three part harmonies, gripping lyrics, and melodic bass, The Defeated County has a way of capturing any audience’s focus. Check out the beautiful video for “Gonna Be Damned” here! 12/12 – Listen for Langen, Jeremy, Irene, and Devon sharing songs and stories on Rock Paper Podcast for Jeremy’s birthday! Welcome to The Defeated County’s Blog, Langen, our main singer/songwriter, will be updating you about our life as a band. To get in touch with the Defeated County for booking or anything else, please contact Langen Neubacher at defeatedcounty@gmail.com. We’d love to come play for you.